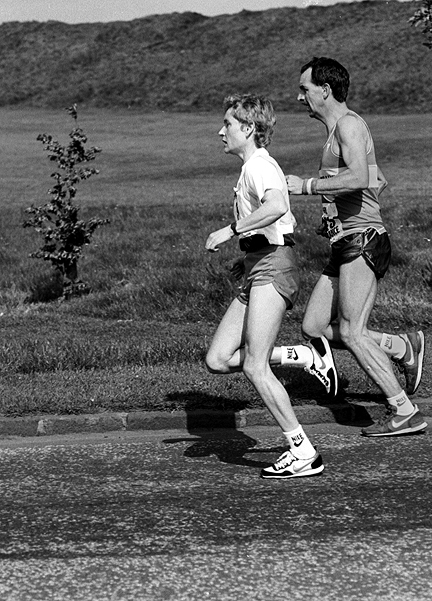 Lynda Bain (nee Stott, born 1956) was the first recipient of the Scottish women’s marathon title. The quietly-spoken school librarian at Bankhead Academy, Dyce, outside Aberdeen, only took up running in 1981 but soon developed into one of the country’s finest distance runners. Her first marathon, at Aberdeen in September 1981, was run in gale force winds with driving rain, making conditions nearly unbearable. Stott showed great resilience in coming home third (3.21.12) behind Katie Fitzgibbon (3.07.46) and Priscilla Welch (3.08.55). In the 1982 Aberdeen Milk Marathon, Lynda Stott showed considerable improvement by taking second place (2.53.04) not far behind Jacqui Hulbert of Wales (2.52.20) but this time in front of future marathon great Priscilla Welch from Shetland (2.55.59). After her marriage, the North-East woman returned to Aberdeen in September 1983 to collect her first national title, clocking 2.50.29 to gain revenge on Welsh athlete Jacqui Hulbert (2.56.20) and Aberdeen AAC clubmate Morag Taggart (3.07.08). Lynda Bain was presented with the Scottish Ladies Championship Barratt Trophy. In 1984, Lynda made a rapid start in an attempt to defend her Scottish Women’s Marathon Championship. She knew that world-ranked American Gillian Horowitz had entered; but did not realise until ten miles that she had not actually turned up, due to bad weather stranding her plane in Edinburgh! Despite struggling briefly about the 18 mile mark, Lynda managed to hang on well to retain her title, taking three minutes off Leslie Watson’s Scottish Native Record with her time of 2.41.41. This was Lynda’s seventh personal best in ten marathon outings. Margaret Baillie of Fife AAC was second in 3.00.57 and Morag Taggart, now of Pitreavie AAC, picked up a second bronze medal in 3.10.03. For this performance, Lynda Bain was chosen to represent Great Britain by racing a 1984 marathon in Czechoslovakia. Lynda was part of Aberdeen AAC’s winning team in the SWCCU Scottish Road Relay Championships in 1985. Lynda Bain’s finest race was on 21st April 1985 in the London Marathon. This was a particularly memorable edition of the event. Steve Jones of Wales set a course record (which lasted twelve years) of 2.08.16, not far in front of Charlie Spedding’s English record of 2.08.33 and Allister Hutton’s Scottish record of 2.09.16. Charlie and Allister continue to hold those records, 25 years later! In addition, the great Ingrid Kristiansen of Norway created a new world record of 2.21.06. She was probably helped by the fact that there was on this occasion a mixed field of men as well as women, providing shelter or targets to overtake. Sarah Rowell set a new UK record of 2.28.06 and Lynda Bain finished 7th in an excellent 2.33.38, a new Scottish record. She was two places in front of Veronique Marot, who went on to win the race in 1989, when she set a new UK record (2.25.56) which lasted until Paula Radcliffe amazed everyone with 2.18.56 in 2002. On the 9th of June, 1985, Lynda won the Marathon 16 mile road race in 1.30.27, eight minutes in front of 50 miles world record holder Leslie Watson. Lynda said this was “a good run over a difficult course in poor conditions” but stated that she intended in the near future to switch from marathon training to concentrate on trying to build up her speed over shorter distances like 10k. Even after her 1985 peak she recorded track PBs for 1500m (4.41.9 in 1988); 3000m (9.51 in 1988); and 5000m (16.51 in 1989). Her July 1985 half-marathon best was a fine 73.22 in Aberdeen. Sadly, injuries subsequently hampered Lynda’s running career; and she never fulfilled her dream of competing in the Commonwealth Games. However she was still good enough to win the Moray Marathon (3.06.49), representing Garioch Road Runners, as late as 1995.